Jezzy a bear with attitude - OTT and loving it! 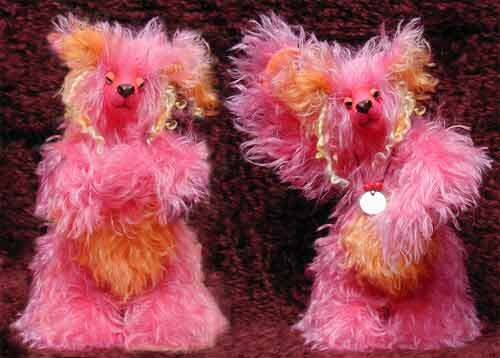 Deliciously hand dyed scruffy mohair in shocking pink with a tangerine and ear fronts , hand painted sparkling glass eyes, tangerine eyelids and paws and my trade mark hand moulded leather nose and Woodland teddies tail. Hand dyed mohair, hand painted eyes, weighted tail, shaped paws and a beaded brass personalized name tag.